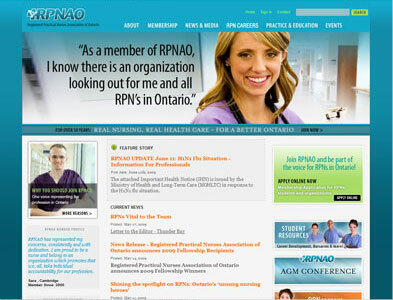 RPNAO approached Intrigue with a variety of needs including a redesigned website focused on membership retention, the need to educate RPN's in Ontario with a concentrated focus on membership registration and renewals. Intrigue responded with a revamped site, easy to manage news system & events calendar, and the implementation of a custom membership renewal and management system. We involved our professional design partner Swerve on this project. With Swerve's design expertise this site has been an overwhelming success, both in the eyes of visitors and based on the positive feedback received from the client. A big thanks to all involved! Want to see more? Visit the RPNAO website at: www.rpnao.org.